This packet contains 20 Mostly Religious (Daisies, hearts, and children are not strictly religious designs.) 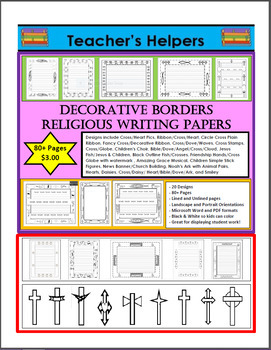 Border Designs in both lined and unlined versions in PDF and Microsoft Word format. 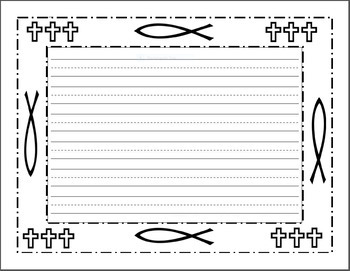 Designs include Cross/Heart Pics, Ribbon/Cross/Heart, Circle Cross Plain Ribbon, Fancy Cross/Decorative Ribbon, Cross/Dove/Waves, Cross Stamps, Cross/Globe, Children's Choir, Bible/Dove/Angel/Cross/Cloud, Jesus Fish/Jesus with children, Children, Black Outline Fish/Crosses, Friendship Hands/Cross Globe with watermark,Amazing Grace Musical, Children Simple Stick Figures, News Banner/Church Building, Noah's Ark with Animal Pairs, Hearts, Daisies, Cross/Daisy/ Heart/Bible/Dove/Ark, and Smiley Face/Crosses. Each design comes in a Lined PDF and Word form and an Unlined PDF and Word form.That's 4 sheets of each design totaling 80+ designs in all. Two line styles are represented including one for early primary and one for upper primary/middle school. Also, both portrait and landscape orientations are represented among the different designs. Print one design at a time, many designs at once, or print multiples of each design. 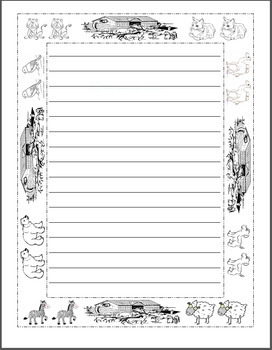 All designs are in Black & White so children can color them. 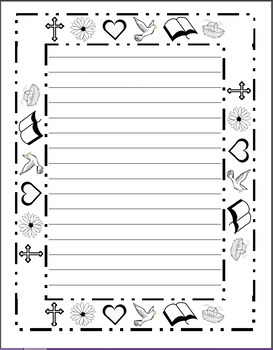 Great for bulletin board assignments and other work displays.Great for Take-Home messages/notes, etc. Print to Fit on 11" X 14" or 81/2" X 14" paper for an even larger display. Don't see what you need here? Contact me through my TPT store for custom designed papers.